Sometimes in history there’s a backstory as interesting as the main story. First, the main story, about a health problem in the fields of early 20th century San Diego County. “The Harvest Bug That Has A Vicious Bite,” was the title of a short article in the San Diego Union October 19, 1919. 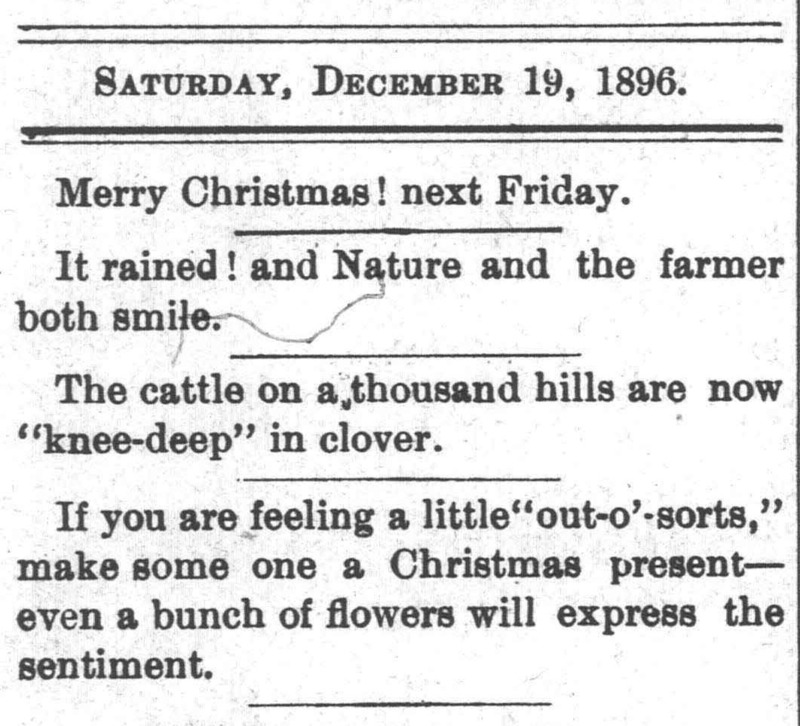 But a local doctor, who also happened to be a rancher, found a rough but effective cure. Nina Allen, a native of Ohio, had earned a medical degree from Western Reserve University (now Case Western Reserve) in 1910 and practiced medicine for a time in Cleveland. She came to Fallbrook in 1912 and set up a medical practice there. Among Dr. Allen’s patients were two elderly Fallbrook pioneers in their late eighties, Henry and Martha Gird, whom she cared for until their deaths in 1913. In 1914 Dr. Allen married Henry and Martha’s son Will Gird. But the 1919 article shows she obviously tried to continue her healing practice, both as a partner in her husband’s ranch, and, through her letter to the AMA, to the general public. Over the years, as a clerk of the Bonsall school board and a Red Cross volunteer, she would continue to contribute to the health and welfare of her community, while raising a family and helping run a cattle and horse ranching operation. After the death of her husband in 1946, Nina Allen Gird sold the ranch and moved to the city, but she stayed active in charitable and civic work. Over the decades until just a few years before her death at the age of 87 in 1972, she wrote numerous letters to the editor of the Union on subjects such as childhood nutrition, recreation and education. Sources for this post included the archives of the Fallbrook Historical Society, interviews with Gird family members, and Ronald V. May, RPA. 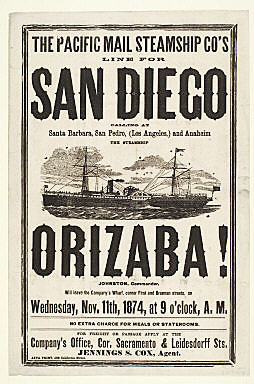 Last week I wrote about the role that one steamship, the Orizaba, played in the history of San Diego City and County, in terms of the number of residents, noted and ordinary, who first came here on the vessel over its 22-year history carrying people between San Diego and San Francisco. For eleven of the 22 years that the Orizaba made San Diego her home port, she was commanded by the same man, Henry J. Johnston, and he was as well known in San Diego as his ship. In 1878 Johnston was assigned command of a newer steamer, a command he unfortunately never took up as he died on December 28, 1878 after an accidental fall at this San Francisco home. But that wasn’t the end of the influence of the Orizaba and her long-time skipper on San Diego. When she came into San Diego the Orizaba docked at Culverwell’s Wharf, which jutted out into the bay from what is now the intersection of Pacific Highway and F Street. As the ship made her way toward the dock, Captain Johnson used a spot on a hill to the north as a navigational aid. After one particular voyage, Johnston became curious about that geographic point and hired a coach and driver to take him up there. Entranced by what he saw, he bought 65 acres with the hope of constructing a home there on his retirement. Captain Johnston never lived to carry out his dream. His widow, while remaining in San Francisco, continued to own the San Diego property until May, 1887, when she deeded it to her daughter, Sarah Johnston Miller. Miller came to San Diego and with her husband built a Victorian house which she named Villa Orizaba. She also filed plans to develop the still-rural landscape around the house as a community designated Johnston Heights in honor of her father, for whom a street in the new tract was also named. The good ship Orizaba, over 30 years old, had at that point been taken out of service and sold for scrap. Sarah Miller acquired some parts of the ship for the construction of her home. Villa Orizaba, under different owners over the years and considerably remodeled and relocated, remains standing in its original neighborhood, on a street named Orizaba. The former Johnston Street is now called Sunset Boulevard, and the former Johnston Heights is now better known as Mission Hills. Sources for this article included historic San Diego newspapers, Richard Pourade’s series of books on the history of San Diego, The Journal of San Diego History, and the website of Mission Hills Heritage. Readers of this blog may recall my entry on Foster, a town which existed for a few decades in a canyon which is now part of Lakeside. The town was named for its most prominent citizen, Joseph Foster, rancher, hotel owner, road builder and, in the early 20th century, a county supervisor for 23 years. This episode touches on one little detail of Joseph Foster’s life which he shared with a lot of prominent citizens from what was then called the “back country.” That detail was to send your children to live in the city of San Diego when it was time for them to attend school. There were of course, schools out there in rural north county, often one or two-room structures where multiple grades were taught. So one could understand someone like Foster, who was in a position to do it, seeking what he thought was a better educational environment for his children.